tabe kene paṇḍita saba tāṅhāte vitṛṣṇa? rājā kahe—the King said; śāstra-pramāṇe—by the evidence of revealed scripture; caitanya—Śrī Caitanya Mahāprabhu; hana—is; kṛṣṇa—the Supreme Personality of Godhead, Lord Kṛṣṇa; tabe—therefore; kene—why; paṇḍita—so-called learned scholars; saba—all; tāṅhāte—unto Him; vitṛṣṇa—indifferent. bhaṭṭa kahe—Sārvabhauma Bhaṭṭācārya said; tāṅra kṛpā—of Lord Caitanya’s mercy; leśa—even a fraction; haya—there is; yāṅre—unto whom; sei se—that person only; tāṅhāre—Lord Śrī Caitanya Mahāprabhu; kṛṣṇa kari’—accepting as Kṛṣṇa; la-ite pāre—can take up. The saṅkīrtana movement can be spread by a person who is especially favored by Lord Kṛṣṇa (kṛṣṇa-śakti vinā nahe tāra pravartana). Without first obtaining the mercy of the Lord, one cannot spread the holy name of the Lord. One who can spread the Lord’s name is called labdha-caitanya in the words of Bhaktisiddhānta Sarasvatī. The labdha-caitanya is one who has actually awakened his original consciousness, Kṛṣṇa consciousness. The influence of the pure devotees in Kṛṣṇa consciousness is such that it can awaken others to become immediately Kṛṣṇa conscious and engage themselves in the transcendental loving service of Kṛṣṇa. In this way the descendants of pure devotees increase, and Lord Caitanya Mahāprabhu takes much pleasure in seeing the increase of His devotees. 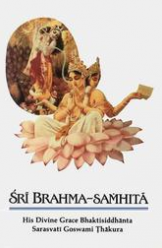 The word su-medhasaḥ means “sharply intelligent.” When one’s intelligence is sharp, he can increase the interests of common men in loving Caitanya Mahāprabhu and through Him in loving Rādhā-Kṛṣṇa. Those not interested in understanding Śrī Caitanya Mahāprabhu are simply material in their attempts at professional chanting and dancing for money, despite their supposed artistry. If one does not have full faith in Śrī Caitanya Mahāprabhu, he cannot properly chant and dance in the saṅkīrtana movement. Artificial chanting and dancing may be due to sentiments or sentimental agitation, but this cannot help one advance in Kṛṣṇa consciousness. tāṅra kṛpā—His mercy; nahe—there is not; yāre—unto whom; paṇḍita—learned scholar; nahe—even though; kene—nevertheless; dekhile—even by seeing; śunileha—even by listening; tāṅre—Him; īśvara—as the Supreme Personality of Godhead; nā māne—does not accept. The same principles can be applied to demoniac persons, even though they be in the sampradāya of Lord Śrī Caitanya Mahāprabhu. Without receiving the Lord’s special power, one cannot preach His glories all over the world. 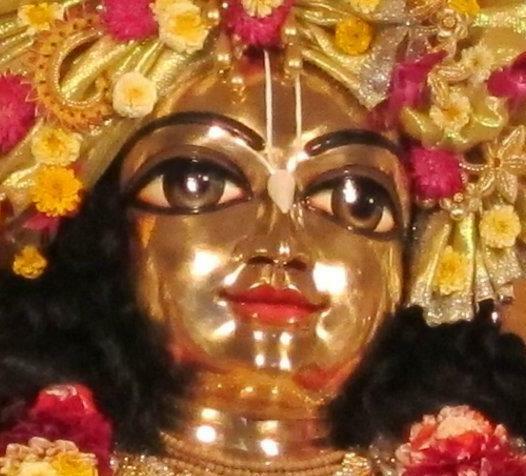 Even though one may celebrate himself as a learned follower of Śrī Caitanya Mahāprabhu, and even though one may attempt to preach the holy name of the Lord all over the world, if he is not favored by Śrī Caitanya Mahāprabhu he will find fault with the pure devotee and will not be able to understand how a preacher is empowered by Lord Caitanya. One must be considered bereft of the mercy of Śrī Caitanya Mahāprabhu when he criticizes the Kṛṣṇa consciousness movement now spreading all over the world or finds fault with this movement or the leader of the movement. This verse is a quotation from Śrīmad-Bhāgavatam (10.14.29). It is explained in the Madhya-līlā, in the Sixth Chapter, text 84.